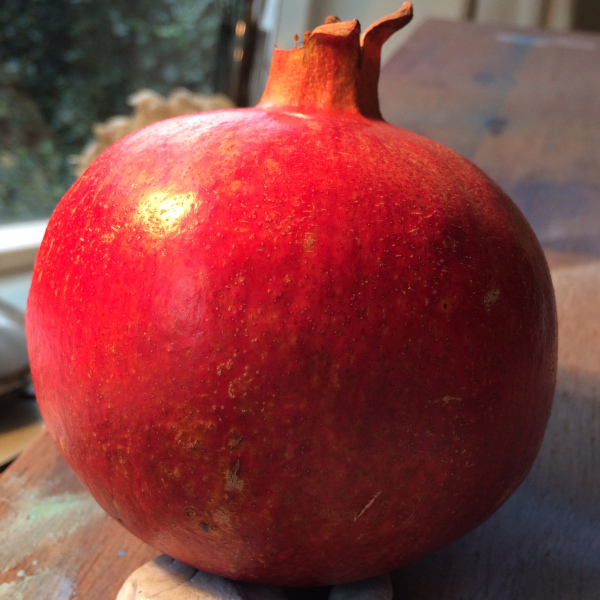 Assignment 6 of the Society of Botanical Artist’s Distance Learning Diploma involved painting a fruit of our choosing. I really struggled with my choice of fruit in my head, but as soon as I got out into the local farm shops I was instantly struck by these pomegranates. I got out my kitchen knife and you can see the results below! Choosing the composition was quite difficult. As I mentioned above, to say there was a pressure of time is a huge understatement, but it was entirely my own fault so I just had to plow on. 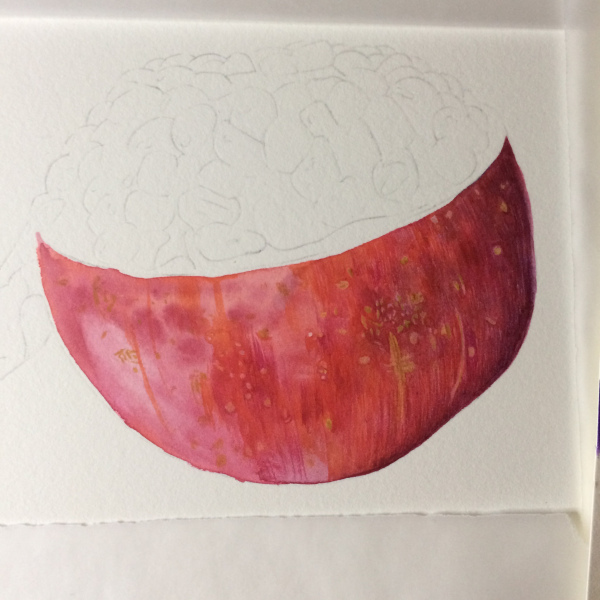 I did do one small study, but basically I just dove in, I had to… I started work first on the main bulk of the skin, using varying mixes of Quinacridone Rose (Daniel Smith), Alizarin Crimson, Cobalt Blue, Scarlet Lake (all Windsor & Newton). I laid down a number washes to build up the depth of colour using the wet-in-wet technique. I did try and give the impression of the textured skin even at this stage. Next I went onto the seeds. These I did do some practicing, as it was really important to capture the highlights, the translucency with the inner seed inside, as well as the bright pink colour. The next part I had to work on was the twirl of skin. The outer part was just a continuation of the process I had used for the main bulk of the skin, but the inner pith required a mix of a botanical grey, with some yellow ochre, really trying to demonstrate the texture inside where the seeds lie. The feedback I received was generally good, which I was very surprised about but obviously very pleased. The main critique was that the way the skin fell to the left hand side of the fruit wasn’t quite believable. This was in fact how it did fall, but I do agree that it would make more sense to the eye to have it coming from slightly higher up! Sometimes we should use our artistic licence to help the eye understand the image. Thank you for reading - the next assignment is vegetables!